With modern engines and up to date lubricants it’s an unusual sight to see any of today’s overhead camshaft, multi valve engines in need of a rebuild. However it does happen as modern engines do need proper maintenance, especially when it comes to the changing of cam belts. In any engine, especially those of the modern era if a cam belt breaks you usually end up with a catastrophic coming together of pistons and valves. Thank heavens there are knowledgeable engine rebuilders about who have gained their knowledge and expertise through years of proven services. Dandenong Rebores is one such company having been started by Frank Fankhauser over 46 years ago. 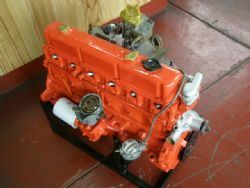 Still under Frank’s ownership Dandenong Rebores are prepared and equipped to rebuild any engine including modern multi valve units, light diesel, 4WD and tractors. 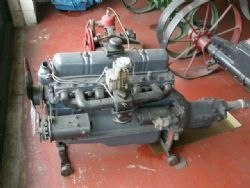 However manager Don Jewell who has been with Dandenong Rebores for over 14 of those years tells us that they do specialise in vintage car engines, a field that not many are involved in these days. Needless to say, to rebuild any engine Dandenong Rebores is fully equipped for every contingency. If it’s a cylinder head that needs attention Dandenong Rebores can glass bead blast, crack test, pressure test, machine, valve guide installation, valve seat cutting and milling. For cylinder blocks they are also suitably equipped for line boring, cylinder boring/honing, conrod resizing, crankshaft machining, pin boring, balancing and general lathe machining. 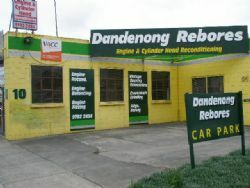 Dandenong Rebores are also fully equipped to offer a drive-in, drive-out service for customers who wish to leave their car while the engine is being rebuilt. Don Jewell told us that they take extra care including painting the engine in original colours so that when completed, under the bonnet of your car looks like when it left the factory. However Don did say that they do not offer an exchange engine as their service is available to those vehicle owners who want their own engine repaired. This is especially popular for owners of newer vehicles such as after damage from broken cam belts. All work undertaken by Dandenong Rebores carries a 12 months or 20,000 warranty. Hands on classic car enthusiasts who want to rebuild their own engine will be pleased to know that Dandenong Rebores is also more than happy to undertake any machining that may be required. This includes reboring, crankshaft grinding and anything else leaving the owner to undertake the assembly. This service is also available to other trade workshops as well. Don did say that they prefer to work on standard engines and not those being rebuilt for performance in mind. With the combined experience of 8 staff members Dandenong Rebores can take on any engine including the more unusual. Don says that the more out of the ordinary tasks such as white metal bearings are not a problem and the supply of parts is never a difficulty. Dandenong Rebores also offers to pick up and deliver if this assists. Don Jewell says that it is not uncommon for a Holden Commodore V6 engine with proper maintenance to last for over 500,000 kilometres before a major rebuild is required. To assist Dandenong Rebores is also quite prepared to undertake engine maintenance such as changing those all important cam belts, ensuring that you don’t need to pay a longer visit in the not too distant future. 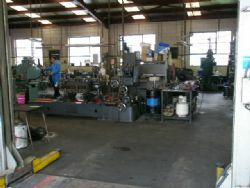 So if you have an engine that needs machining, rebuilding or perhaps just a little preventative maintenance give Don Jewell at Dandenong Rebores a call.